As a community we live together in peace and love one-another for the sake of Allah. We have regular gathering in the Masjid beside the five-time daily Salat and Jumma Salat. We stand beside any person or nation at the time of need. ‘Salam Alaikum‘ is a common Islamic greeting in Arabic used in all Muslim cultures through out the world. In Sarnia-Lambton, the Muslim Association was founded in 1979 by a handful of Muslim families. Today, there are over 80 Muslim families residing in the greater Sarnia area from twenty-two different countries. Their common goal is to practice their faith and share their culture in a peaceful and cohesive way. Central to this goal is having a place of worship, which in the Muslim faith is called a Masjid (mosque). A great source of pride for the Sarnia Muslim Association is the new 7200 square-foot mosque, which opened in July of 2004. Most of the funds for this project were raised within the Sarnia Muslim community. This facility was built on almost 8 acres of land, and there is plenty of room for future expansion as well as a large playing field for the younger members. The mosque was built according to the traditional design such as having elegantly curved arches and a ‘Mehrab’, or niche on an inside wall, indicating the direction to ‘Mecca’ in Saudi Arabia. Practicing Muslims pray five times a day facing Mecca. Another distinguishing feature of the mosque is the outdoor dome-like sign with the image of the crescent moon and an eight-sided star. The crescent moon symbolizes the first day of the new month. Sighting the new moon determines Muslim feast or Eid, a joyful celebration of the achievement of enhanced piety. Muslims celebrate two Eids: the first marks the end of Ramadan (the month of fasting) and the second marks the end of the Hajj (pilgrimage) season in Mecca. 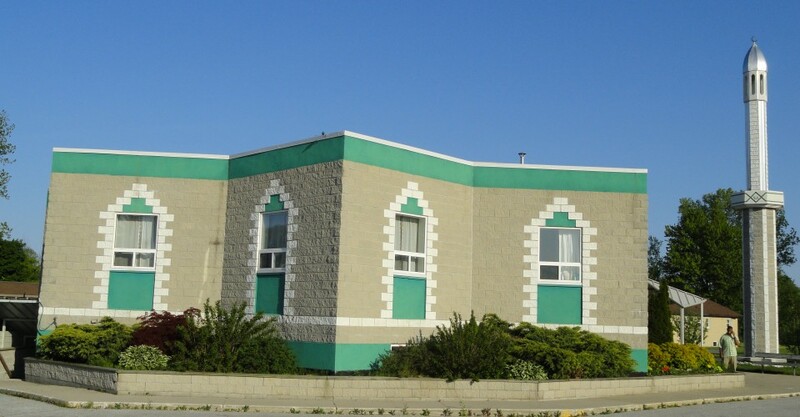 According to the president of the Sarnia Muslim Association, most of the families which arrived first in this area in the 1970s were professionals such as engineers, scientists, and medical doctors. However, recent immigration in the early 1990s has brought more small business owners and other versatile entrepreneurs. In fact, the new mosque was built by a local construction company with roots in the Muslim community.